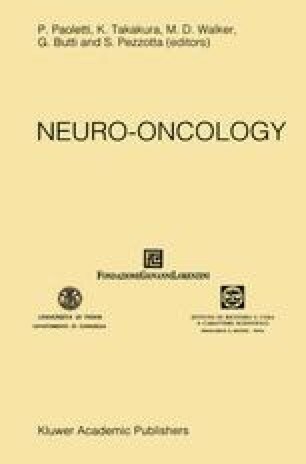 Clinical application of human monoclonal antibody (MAb) CLN-IgG was conducted to 7 patients of recurrent malignant glioma. 131-I labeled MAb was administered intratumorouly and scintigraphy was monitored. Specific incorporation of radioMAb was demonstrated on the image, indicating the 10% of radioactivity was distributed in the tumor region. Concomitant administration of interferon enhanced the efficacy of this therapy. The beneficial results have been obtained in 5 patients. No side effects was observed. This radio-immunotherapy holds future promise as a new therapeutic approach to malignant gliomas.